Apparently the entire Obama administration has been taking Hillary Clinton's TV recommendations. In addition to being forced to participate in Grey's Anatomy marathons, that means more staffers are tuning into Al Jazeera, the network Clinton recently praised for providing, "real news around the clock instead of a million commercials." "The emir of Qatar came by the Oval Office today, and he owns Al-Jazeera basically ... Pretty influential guy. He is a big booster, big promoter of democracy all throughout the Middle East. Reform, reform, reform. You're seeing it on Al-Jazeera." "It's like Rip Van Winkle - you wake up and, my God, it's a different world ... Hosni Mubarak did in 18 days what I thought it would take two years to do." Burman says White House officials tell him they've been watching protests in the Middle East on Al Jazeera, and when walking through the State Department he sees it on "virtually every TV and computer." The vast majority of American cable providers still don't carry the network, but the uprisings in Tunisia and Egypt in particular led to a greater demand across the country. 50,000 people responded to recent newspaper ads encouraging people to ask their providers to carry the station. 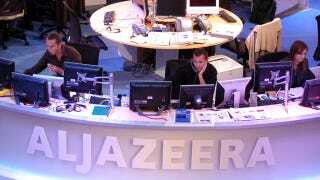 "To Comcast, and other cable and satellite providers, we say, do not expand Al-Jazeera throughout the U.S. Otherwise you will increase the chances of Americans being killed by those manipulated by ‘Jihad TV,' the terrorist network, and you, Comcast, will have blood on your hands." Kincaid is right. Al Jazeera, like all news, has a bias. Right now both the network and the U.S. government are backing the democracy movements in the Middle East, but you never know when the network will start criticizing U.S. policy again. If we allow Americans hear other viewpoints, including some they may not agree with, we'll definitely be letting the terrorists win. It's probably best to limit cable offerings to only a few news networks, preferably those we know are fair and balanced.